Christmas is coming real soon. Do you want something cool like a Christmas tree stand in your house for this special occasion? You have come to the right place. The very first item on the list is a green Christmas Tree Stand. 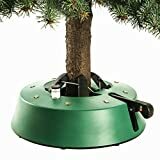 This Christmas tree stand has a foot pedal in which you can use to tighten the tree so that it can stand straight. More than that, the stand itself weigh only 12.2 pounds; it is not only strong and secure, but it is very convenient and dependable. The stand also has a water level indicator that is made easy for you to know when you can add water. Easy to use and adjust. What’s more, it only takes a short period of time to set up. What about something like a tabletop tree stand? This Christmas Tree Stand weighs only 1.3 pounds, making it easy to move around for clean up or reposition. Moreover, the design is just perfect because it can hold trees up to 3-inch diameter trunks and hold up to ¾ gallons of water to keep the tree fresh and safe. On of these features, this artificial tree stand is known for its reliability and durability. Hence, for the price of this tree stand you will get what you pay for. Note: this product can be used with both real and artificial trees. How handy! This Jack Post Tree Stand comes in powder-coated red and green. The product is made from steel, it is 11 inches in size, and the capacity is 1.5 quart. Talking about the design, it is breathtaking. The product has a unique design that comes with 4 legs stand. And, the color of this artificial tree stand is just perfect as it matches with the theme Christmas. Own one and decorate your Christmas tree with this gorgeous tree stand. Made of welded tubular steel, it is the Jack-Post Welded Christmas Tree Stand. This stand for trees is known for its quality, as it is sturdy due to the fact that is can hold trees of up to 12 feet and store water up to 1.7 gallon. In addition, the price is unbeatable if you are looking for a stunning tree stand for this upcoming Christmas. You may not want to miss out on this one. What a unique and stunning design! Different from other tree stands, this is one of the best artificial Christmas tree stands that are equipped with 5 stabilizer feet for additional security. Obviously, addition to the great design, the quality is another great thing about this product. Once, you have your tree ready, you can just pump the foot pedal until the claw firmly hold the trunk, then it is all done. You can set up this amazing Krinner’s Christmas tree stand in less than a minute. It is super easy. Made to last! This Handythings Tree stand will definitely be a great choice for this Christmas and the following years. Made from plastic, this is the best Christmas tree stand for holding trees of up to 8-feet. More than that amazing strength it can stand, this product can store1.3 gallon of water to make sure that your tree is lively and safe for Christmas. Note: 5 years limited warranty is included. 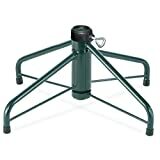 Another appealing product in store; this is the Emerald Innovations Swivel Straight Tree Stand, a round shape tree stand that will not crack, rust nor harm your floor. Furthermore, this rotating Christmas tree stand has large bolts with comfortable handles that can attaches tree of 5” in diameter. What’s more, its water capacity is 3.5 quarts; therefore, your tree will always be fresh and ready for Christmas. 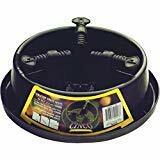 Even with this large water stock, this rotating tree stand will not spill over during disassembly because it has a perfect drain slots. You sure will love it. What a very classic design! This tree stand comes in medium size that is perfect for tree up to 10-Feet tall and suitable for 17.78 centimeter trunk diameter. It can do more than that. The water reservoir is 2 Gallon, hence, it will always keep your tree in a perfect shape and you will spend less time watering the tree. This Christmas tree stand is perfectly made and it is very convenient. It is more than just good quality and durability. Coming in various sizes ranging 16-inch to 36-inch, this product is made from sturdy steel construction. This tree stand is suitable for 6.5 to 8 feet tall trees and 1.25” diameter center pole. And, it weighs about 3.5 pounds. The size and shape is incredible, and it will not take up a large space or a lot of time to set up and decorate your beautiful Christmas tree! The very last item on the list is the very one, the Krinner’s Tree Genie XXL Tree Stand! As its name suggests, this is the perfect Christmas tree stand for big trees. The product can withstand trees that are up to 12 feet tall securely. It retains about 2.5 gallons of water with automatic water level indicator. It comes in a round shape that is coated with wire cable, which is quite unique from other tree stands. Setting this tree up is a breeze as there is no assembly or screwing required. Invest in a high-end product, and you’ll get what you pay for. Choosing one best Christmas tree stand to decorate in your house can take you a long period of time to decide. As you have already seen these top 10 products in the list, you might probably have selected and chosen the ideal Christmas tree stand for own design already. Happy early Christmas!